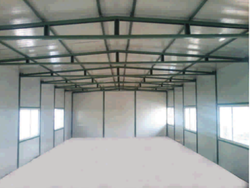 We deal in GI EPS Sandwich Panel of best quality and we offer them to our clients. We procure our panels from some of the authentic dealers of the industry. Our single piece of sandwich panel comprises of a fully insulated core and two metal faces. We are offering EPS Sandwich Panels to our client. In order to keep pace with never ending demands of the customers, our company is instrumental in presenting an excellent quality assortment Sandwich Panel. In order to keep pace with ever growing requirements of the customers, our company provides supreme quality assortment of EPS Sandwitch Panel. This EPS Sandwitch Panel is designed by using advance machines and tools by our professionals. To get the total satisfaction of customers, we offer this product at market leading price.